December 14, 2000 Deck the decks with boughs of holly – the holiday season has descended upon Cherokee. She’s snug in plastic-covered shed walls and the warmth of two woodstoves. The crew, including boat carpenter and guitar builder extraordinaire Jeff Heyland, has hunkered down to their winter work. 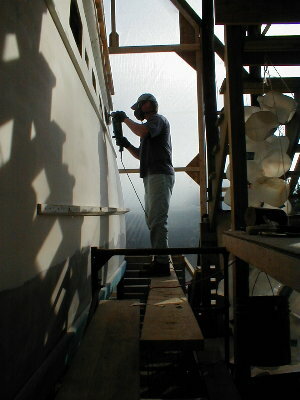 Jeff, sanding chines, installing temporary frames, and dry-fitting laminations, is re-planking the bottom, aft. 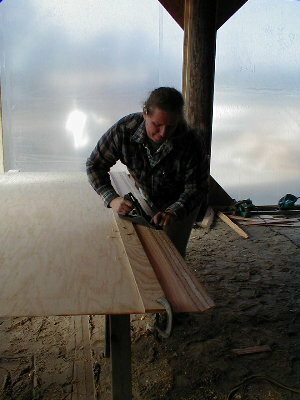 Meanwhile Robbin and Tom are cutting glue-joint scarfing for the bottom work. The crew mesh together so well now that Bryan calls them “the Borg”, a Star Trek reference to several individuals who work as one big unit. Leonard has completed the removal of paint using a sixty grit disk. 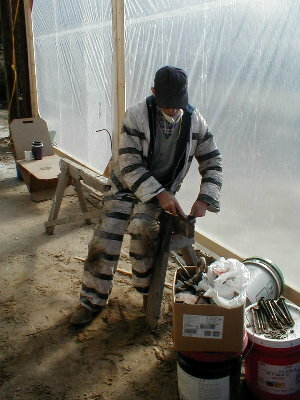 He is preparing to sandblast the bottom. 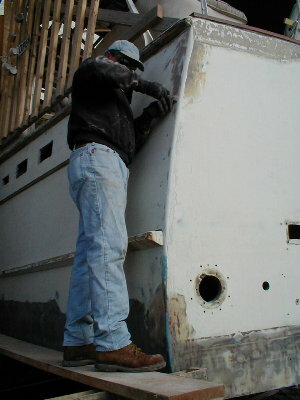 Upon finishing the sandblasting, the initial sanding of the hull will have been finished. Robbin and Jeanette have completed the interior paint removal. 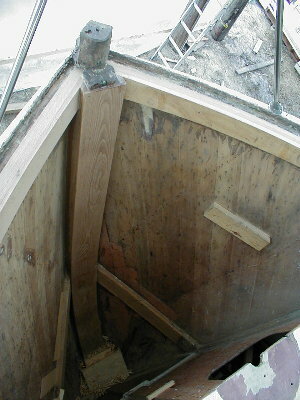 Jeanette took particular care with a mahogany panel that was too thin to sand. She used steel wool and paint remover to tackle the seven layers of paint, one layer of varnish, and stain on the very thin (less than 1/16th inch) veneer. 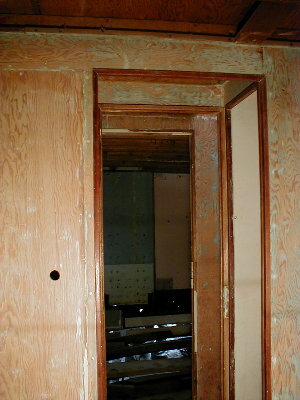 This will protect the veneer for future work should the original doors continue to be used. The door covered what was a massive 32 volt panel in the aft bunk room. A 12 volt breaker system will replace the old panel, and will be located on the bridge. 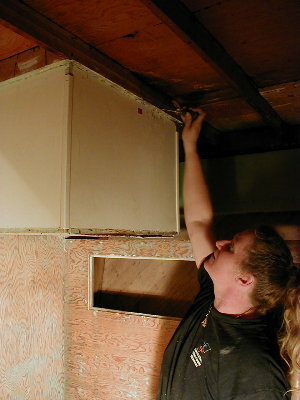 The bunk room panel will be converted into a hanging locker. John has finished up the stem repair, explaining that the rope locker used to feel like a hole but now feels like a snug burrow. 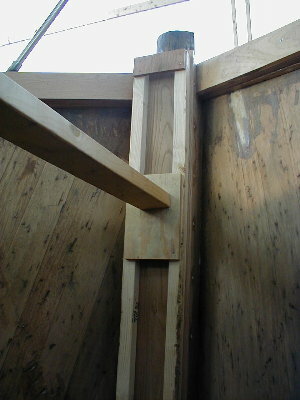 He installed the remaining sheer clamps and the stem plate. 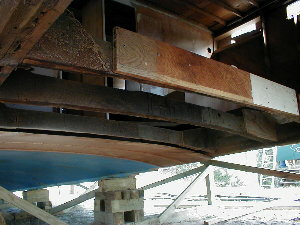 He repaired the chine log and beveled the top of the new sheer clamps to match the deck. Finally, John cut and installed the stem face cap. 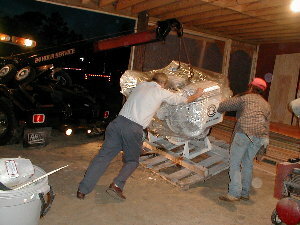 The big excitement of the week was the arrival of Cherokee’s twin engines from Florida. 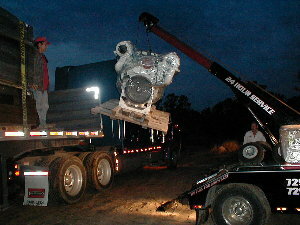 Gleaming white and wrapped in plastic, the engines were lifted off the semi by Mason’s tow truck. Each GM V-8 92 engine weighs around two tons.